I was looking around for a new sport to do with some friends in the summer of 2008 and I got roped in to trying a six week fencing course. Fencing is something I thought about trying before but I was always put off by the high price of the gear and club membership at some fancy dan place where the lockers only take £50 notes. One of my friends came across an advert for the London Fencing Club and got us a group discount so it ended up being cheap as chips. 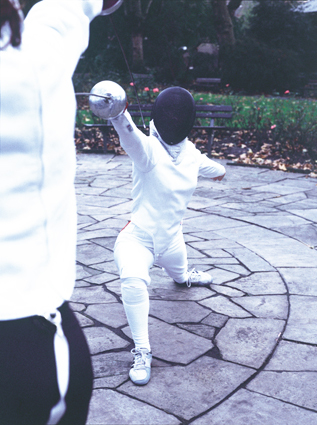 The video below shows fencing master Tim Gadaski showing some beginners through the finer points of the sport. The dramatic music and funny grain look to the film make it look very serious but these newbies are just a clueless as I am. As a sport it’s ridiculously fast and technical requiring excellent coordination and balance. The first five sessions involve a fairly tough warm up (you can do yourself a mischief quite easily if you don’t warm up properly) followed by expert tuition from master Tim. By session six we engaged in a full scale tournament with the proper electronic gear registering hits every time we stabbed someone. After the six week course was over you have the option of joining the club. Six of us started off with the intro but only two of us decided to carry on. I decided to try a different weapon and with my first choice of AK-47 not available I decided to use a sword. We had been training with Foils but I fancied having a go at Sabre as you can slash at people and it generally seems a bit more aggressive and macho. The club nights are slightly different in that there is the warm up followed by some technical stuff but with a good bit of ‘free play’ at the end. Far from being anything dodgy it just means you get to have a couple of rucks against other people in the club. Generally, when I get matched up with someone good I end up looking like a prize tool. It’s a friendly atmosphere and the more talented fencers often share some of their gems with the less gifted. All in all it’s quite a fun and interesting way to keep fit.